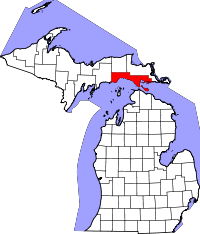 Mackinac County, one of the only counties in Michigan to border two of the Great Lakes, both Lake Michigan and Lake Huron, keeps the county vital and genealogical records at the County Clerk office in St. Ignace, MI. Death indexes are available starting in 1873 and continuing to the present, and marriage records stretch from 1867 to the present. Birth records begin in 1873, as well, and are restricted to the registrant, a legal guardian of the registrant, or a verified relative. Once birth record's age goes past 110 years, they become part of the public record along with death and marriage records. The County Clerk allows two genealogists in the research area at a time, and the office address is 100 N Marley Street. Birth record applications are listed on the County Clerk website and can be mailed in or physically taken to the office.